I found this LP in a local record store, probably five years ago, and paid eight bucks for it. I had never seen it before, and assumed it was a bootleg. But when I looked at the vinyl, I saw that it had a Bizarre label on it. This record didn't look like it was that old (the cover was glossy and the whole thing was in just too good of shape), but the Bizarre label hadn't put anything out since 1973. However, the label, while having the correct Bizarre font and the logo, didn't have much other information. On top of that, the back cover featured artwork that was much in the same style as the inner sleeves of Joe's Garage, which wasn't released until 1979. My curiosity grew. The music made things even more confusing. This isn't some poorly-recorded show, slapped onto wax to turn a quick profit. These are genuine Mothers outtakes that I had never heard before, along with snippets of the band talking. There were a few tracks that I recognized ("Igor's Boogie" and "Take Your Clothes Off When You Dance"), but they were not the versions on the albums. However, "Take Your Clothes Off When You Dance" sounded suspiciously like the version I'd heard on The Lost Episodes, a compilation released in 1996. Recently, I finally figured out what the heck this thing is. I got most of my information from this page, which you're free to read if you really want to nerd out. It is indeed a bootleg, but it has an interesting story. I guess it was supposed to be released in 1969, and they got to the point of making an acetate test pressing, but then it didn't happen for some reason. But one of the Mothers had the copy of the acetate, and let someone copy it for money. It was originally released (bootlegged) as Necessity Is... and Rustic Protrusion. This LP is a bootleg of those bootlegs, released (from what I can tell) around 1985. Turns out a bunch of this stuff was on The Lost Episodes; I just don't listen to that album much and didn't put it together. Most of the other tracks have found subsequent release on other posthumous Zappa collections, but a few still haven't, as far as I know. They're nothing special (and I think one of them - "Hey Nelda" - might even be a Ray Collins solo track), but they're cool to have. This record is cool to have. It would have been super cool to have before The Lost Episodes came out. But it's still a nice one for the ol' collection. 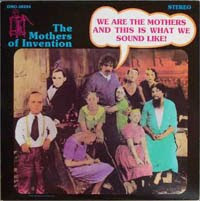 Can't find any audio for this one, but here's some incredible footage of The Mothers of Invention in 1967.